Hello out there in reader land!!!!! 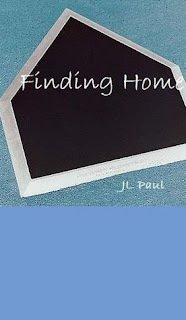 "Finding Home" by JL Paul is an amazingly, heartfelt book and is guaranteed to pull at your heart strings. This book actually made me cry in some parts and had me feeling what the main characters felt, which makes a great book in my opinion. The cover is simple and amazing all by itself. "Top female jockey, MaKenna Nilsen, suffers a horrific accident which takes away her memories. She’s trapped in an unfamiliar world with people she can’t remember. Brett Nilsen, shortstop for the Indianapolis Racers, sees Kenna’s accident on an Internet newsreel and hurries to her side. He’s alarmed that she doesn’t remember him but also a little relieved. He hasn’t spoken to her in months and still hasn’t decided whether or not to file for divorce. When Kenna is released from the hospital, she moves in with Brett, hoping he can help her to regain her memory. As they travel together down memory lane, they rediscover their feelings for each other. One little memory dangles just out of reach - the memory of why Brett left her in the first place. In the meantime, Kenna struggles with the facts of her accident and the memories she has recovered. She can’t shake the feeling that her accident wasn’t an accident and that someone is still trying to seek revenge." When MaKenna wakes up from her accident, she has no clue who she is or what happened. She still has her independence about her, but she struggles to get her life and memories back. She learns she has a husband, Brett, but she can't remember anything about him. Brett feels like he should have been there for her and learns about the accident from the internet. He is conflicted with having her figure things out for herself and telling her why they didn't live together. She is more confused than anything, but being around Brett seems to bring back some of her memories. While you read this book you wonder, what could make these two not see each other for months and why was he thinking about divorce? When you find out that answer you are thrown into a whirl of emotions and find yourself routing for them to see they belong together, and need to get over their little problem. As the reader you also get to see the struggles that MaKenna goes through right along with her and feel the emotions that she feels. This is a great book and should be read, because I can guarantee, if you love mysteries, and love finding a way to each other, than this book is guaranteed to be one of your favourites.